And consider him most fortunate. 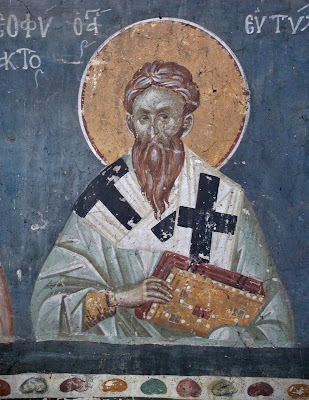 Our Holy Father Eutychios was born in the Phrygian village of Theia Kome in about 512. He was baptized and brought up by his grandfather Hesychios, the presbyter and skevophylax of the Church of Augustopolis, and afterwards went to Constantinople to continue his studies in which he excelled. Understanding that the wisdom of this world is folly, he dreamed of embracing the monastic life. However, God showed him that He called him to another service for the upbuilding of the Church, and he was ordained priest at the age of thirty by the Metropolitan of Amaseia, who wished him to be Bishop of Lazica. When someone else was elected to this see, Eutychios was able to realize his holy desire and retire to a monastery of Amaseia, where he later became its abbot. The Emperor Justinian (527-65), wishing to purge the Church of all traces of the Nestorian heresy, convened a local synod to condemn, even after their deaths, those known as the Three Chapters: the person and writings of Theodore of Mopsuestia, certain writings of Theodoret of Cyrus, and the letter of Ibas of Edessa to Maris. The Metropolitan of Amaseia, unable to attend the Synod because of bad health, sent Eutychios to represent him. During the Synod sessions, the devout and learned Eutychios was much appreciated by the Fathers for his profound knowledge of Holy Scripture and his ability to refute the arguments of the heretics. Recalling the example of King Josiah, who had the bones of idolaters dug up and burned (II Kings 23:16), he declared that one could anathematize the dead to protect the Church against the perverse influence of their doctrine. 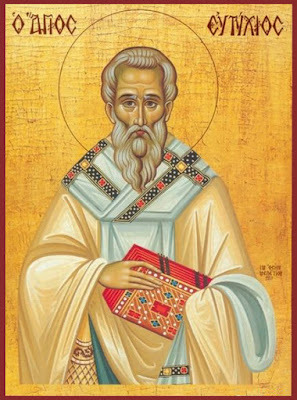 The holy Patriarch Menas of Constantinople (Aug. 25), who had a fatherly affection for Eutychios, predicted after receiving a divine revelation that he would be his successor, and Eutychios was in fact designated by the Emperor to succeed him, to the great joy of the people. As soon as he was installed, this good shepherd, desirous of stabilizing the peace of the Church by means of an Ecumenical Synod, persuaded the Emperor to convene the Fifth Ecumenical Synod in Constantinople in 553. The Synod of 165 Fathers, at which Eutychios presided, confirmed the doctrine of the four preceding Synods and promulgated fourteen anathemas condemning the writings of Theodore of Mopsuestia, Theodoret of Cyrrhus and Ibas of Edessa,* as well as anathematizing Origen and Evagrius, whose written works, in spite of their considerable influence on the doctrine of the Fathers of the Church, had at that time occasioned the rise of a dangerous Origenist current. The Synod ended with a great liturgical celebration, the Fathers went home and the Church was able to enjoy peace for twelve years. However, at the instigation of the father of evil, certain sophists led Emperor Justinian, who was always willing to rally to the Monophysite cause, into the nets of the new heretical doctrine of Aphtartodoceticism, according to which the body of Christ was impassable and incorruptible by nature, so that the Lord was unable to endure the sufferings of the Passion except by a miracle of His own will. ** Realizing that such a doctrine was only a sort of Monophysitism, which called into question the reality of the Incarnation of our Lord Jesus Christ, in another guise, Saint Eutychios opposed the doctrine supported by the Emperor and the Court theologians with all his strength. On 25 January 565, while he was celebrating the Divine Liturgy in the Hormisdas Palace, he was dragged from the sanctuary by men-at-arms and locked up in a monastery in Chalcedon. A tribunal of bishops, compliant to the Sovereign’s will, deposed the holy prelate and condemned him to exile, under the pretext that he ate choice meats and prayed on his knees for long hours. After some time spent in a monastery on the island of Prinkipo (Buyukada), the Saint was sent back to his own monastery in Amaseia, giving thanks to God for having been counted worthy to suffer for the cause of the truth. At Amaseia, he was able to enjoy a welcome tranquillity, and to perform numerous miracles for the afflicted who came to ask for his prayers. 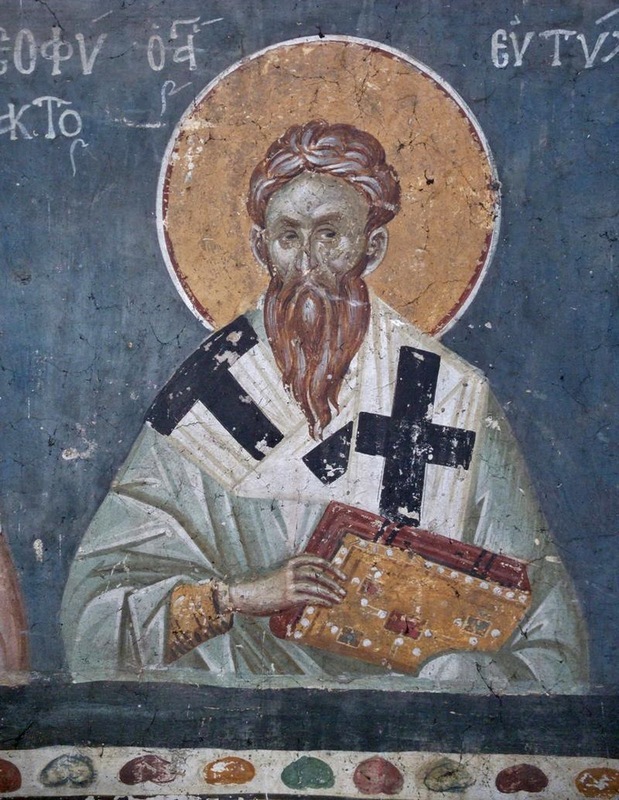 At the end of twelve years of exile, he was recalled to the Patriarchal Throne of Constantinople by the joint Emperors Justin II and Tibrius (576). The whole city, from its highest dignitaries to the simple people, gave him a rapturous welcome, crying out along his way: "Blessed is he that comes in the name of the Lord!" (Lk. 13:35). The Saint, by his prayers, ended an epidemic which had ravaged the city for some time and, when he celebrated the Divine Liturgy in Hagia Sophia, spent six hours distributing the Holy Gifts to the crowd. * It should be noted that the last two were not personally condemned, for they had presented themselves at the Synod of Chalcedon (451) to retract their works written in support of Nestorius. ** In spite of the witness of St. Eutychios’ Life and of the historian Evagrius, it is surprising that the Emperor-Theologian let himself be led into such a gross error. Perhaps it was a tendentious interpretation of his political strategy of reconciling the Monophysites. The deposition of St. Eutychios would therefore have been for another reason. *** His honorable head is venerated today in the Monastery of Hilandari at Mount Athos. Thou didst live like an angel on earth, Eutychios, vessel of grace; thy words and deeds confirmed the divine gift bestowed on thee. By thine intercessions preserve the Church from all necessity. In truth you were revealed to your flock as a rule of faith, an image of humility and a teacher of abstinence; your humility exalted you; your poverty enriched you. Hierarch Father Eutychios, entreat Christ our God that our souls may be saved. 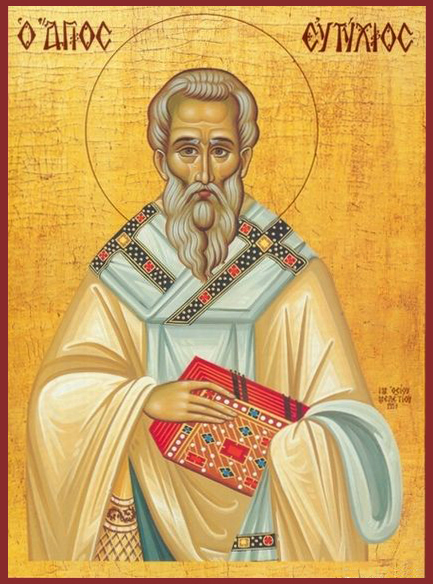 O all you faithful, let us praise holy Eutychios, and let us call him blessed as a great shepherd, minister and teacher, and as a venerable scourge of heresy, for he ever intercedes with the Lord for us all.